Our first annual dinner fundraiser in Atlanta will take place this next year on Friday, March 18th. Invitations will be sent out soon, but in the meantime, we are looking for volunteers! Please email info@theAfricanSOUP.org if you are interested in attending the dinner or helping out. Many thanks to all who came out last night for our 2nd Annual SOUP-off! We had 38 soup-makers, approximately 350 attendees, and raised over $3,000. We could not have done it without you, so thank you all for your support and statuses and soups. These funds will first be directed to the children for food, medical care, school supplies, clothes, and other basic necessities; we will put all remaining funds in our account for the building of the orphanage. 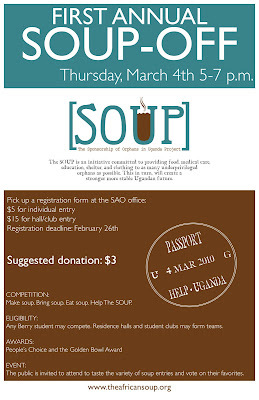 5 days until our 2nd annual SOUP-off. 3 days left to register. We are very excited with this event coming up; last year we were blown away by the 40 soup entries and the 400+ participants that attended. We know that this year's competition will exceed the last for the Golden Bowl, Silver Spoon, and newly added Trustees' Choice Awards. 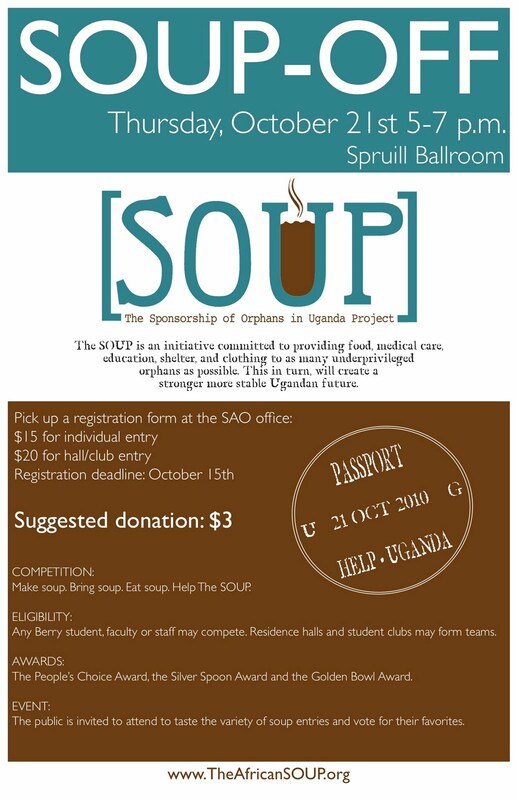 So come out to Krannert's Spruill ballroom on Thursday from 5-7 pm if you are a Berry student, faculty, or trustee, for your voice in this year's SOUP-off. Come taste our 40 soups, meet the faces behind the SOUP, and speak with a panel of people passionate about African and Ugandan culture. Entry fee is $3. Rome, Ga. – A student-initiated nonprofit committed to assisting Ugandan orphans has earned Berry College national recognition through the Jenzabar Foundation’s Student Leadership Awards. Berry joins Brigham Young University, the University of Southern California and seven other institutions of higher learning on the list of 2010 award winners. The Jenzabar program recognizes student groups and their respective leaders who have demonstrated a commitment to making a difference through community service and/or humanitarian endeavors in the United States and worldwide. Honorees receive a $5,000 grant to support their future efforts. Berry was honored for a grant proposal drafted by a trio of students in support of The African SOUP – Sponsorship of Orphans in Uganda Project. This new nonprofit was founded by student Brin Enterkin in response to the tremendous need she witnessed while teaching microfinance to rural Ugandan women in 2009. 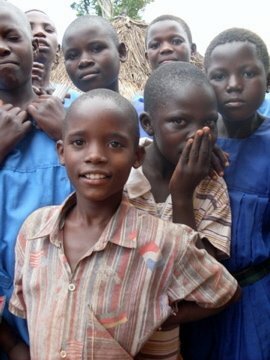 Working in collaboration with Experiential Learning International (ELI), Enterkin and her fellow students are undertaking various initiatives to raise funds that can be wired directly to Uganda to support the country’s nearly two million orphans. The successful grant proposal was prepared by Enterkin with assistance from fellow students Brenna Conley and Morgan West. Enterkin is no stranger to community service. While still in high school, the Fayetteville, Ga., native helped raise funds to build a school in Cambodia. After arriving at Berry, she earned a grant to teach microfinance to women in a rural Ugandan village. 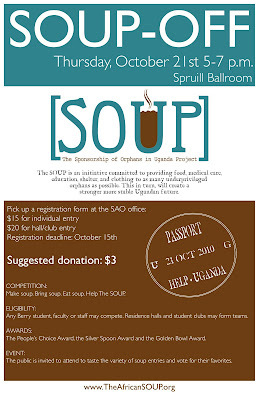 It was that experience that ignited her passion for Ugandan orphans and led to the founding of SOUP. In addition to her work with SOUP, Enterkin also lends her time and talents to the Berry Enterprises Student Team (BEST), a student-led consulting group that provides expertise and assistance for student-operated enterprises on the Berry campus, and serves as CEO of Berry Nonprofit Strategic Services, a student-operated enterprise that provides strategic planning and business planning services to community nonprofit organizations in various levels of development. This summer, she is in Washington, D.C., working as a policy writing intern for the American Friends Service Committee. Learn more about SOUP at http://theafricansoup.org/. EDITORS: E-mail rwoodall@berry.edu to request a photo of Brin Enterkin. Berry College is an independent, coeducational college of approximately 1,900 undergraduate and graduate students that is recognized nationally for the quality and value of its educational experience. Located on a magnificent campus encompassing more than 26,000 acres near Rome, Ga., Berry challenges students to embrace a firsthand education that unites strong academic programs with opportunities for meaningful work experience, spiritual and moral growth, and significant service to others.